Sourdough is more versatile than many people realize. It is wonderful for sweet baked goods like this honey rose cake, to which it lends a light, acidic flavor that compliments the honey, citrus, and floral notes. It is created with a fermentation culture of Lactobacillus bacteria and wild Saccharomyces yeasts that live together in a symbiotic relationship. Breads made with sourdough instead of baker’s yeast can be easier to digest for people with a gluten intolerance. You can buy the starter online or get some from a friend who already has a batch (once it gets going, it multiplies prolifically!). You can also easily make your own using the recipe from my book Sourdough: Recipes for Rustic Fermented Breads, Sweets, Savories, and More. Maintaining a sourdough starter is a bit like cultivating a garden. You must provide food and water on a regular basis and monitor it based on the relative temperature and humidity of your kitchen, but it is not overly complicated once you learn the cycle. As someone who has cultivated roses professionally, I find it difficult not to sneak roses into desserts, and they are the highlight of this sticky-sweet moist cake. It is a delicious treat for the holidays and is made with kamut, a golden-colored hard durum wheat from the Fertile Crescent. (If you cannot source kamut flour, whole wheat pastry flour or even a good quality semolina will suffice.) Once baked, the cake is steeped in a rose-flavored syrup, reflecting ancient culinary traditions of Turkey, Bulgaria, Greece, Jordan, and Egypt. Make the syrup by combining water and honey in a saucepan and heat until dissolved. Remove from heat and whisk in the lemon juice and rose water. Set aside to cool. Preheat your oven to 375˚F. Grease and flour a 9-inch cake pan and set aside. In a small bowl, whisk together the flour, baking powder and soda, cardamom, and salt. In a separate large bowl, beat the butter and sugar together with a handheld mixer until pale and fluffy, about 4 to 5 minutes. Add the eggs, yogurt, honey, and vanilla and mix until combined. Add the starter and beat in with a fork until the batter is smooth. Fold the dry ingredients into the wet about a third at a time, being careful not to over mix. A few remaining lumps are okay. Spread the batter into the prepared cake pan and bake for 20 to 22 minutes, until it begins to pull away from the pan. Remove from the oven, and using a toothpick, poke many holes in the top of the cake. Pour the cooled syrup over the cake in 3 or 4 applications, allowing each to soak in before the next. 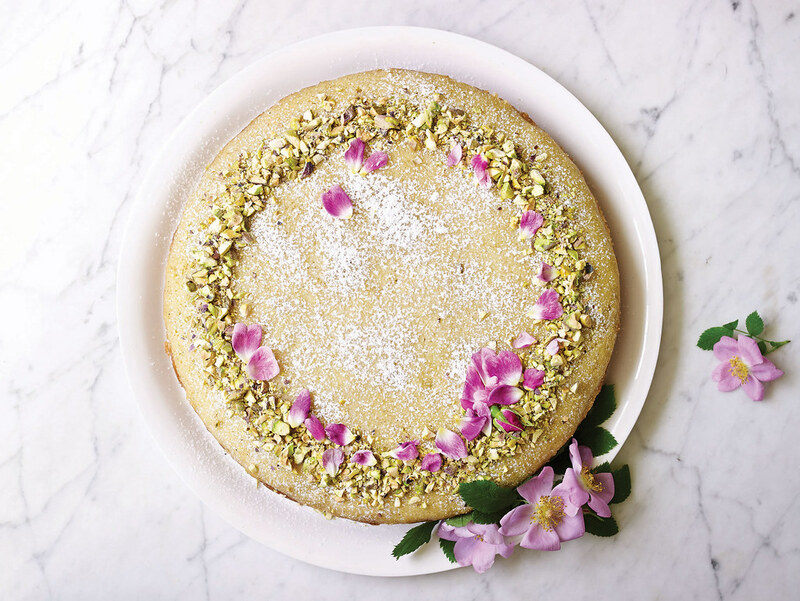 Just before serving, dust with powdered sugar and decorate with the pistachios and petals. This will keep, covered, for several days. From Sourdough, by Sarah Owens © 2015 by Sarah Owens. Photographs © 2015 by Ngoc Minh Ngo. Reprinted by arrangement with Roost Books (roostbooks.com). I love your recipes and have given your book as a gift—thank you for sharing your knowledge! I recently became vegan, and I want to try this recipe out. I do eat honey (when well-sourced), and have replaced butter with no problem, but do you have any thoughts on how this cake would do without eggs (with a substitute)? Cheers! Photo by Ngoc Minh Ngo. 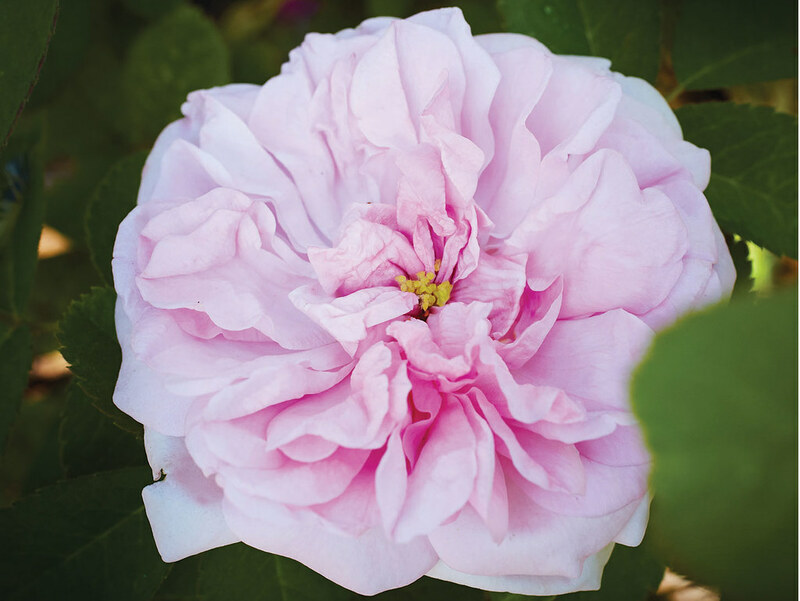 The most fragrant of the old roses is Rosa x damascena, or Damask rose. This venerable hybrid is thought to have originated in the Middle East, or possibly central Asia, and has been prized for its scent and culinary since at least the 13th century. Photo by Ngoc Minh Ngo. Photo by Ngoc Minh Ngo.